Roughly half the amount that the nation’s public school teachers are spending on educational products is being covered with their own money, a new nationwide survey shows. 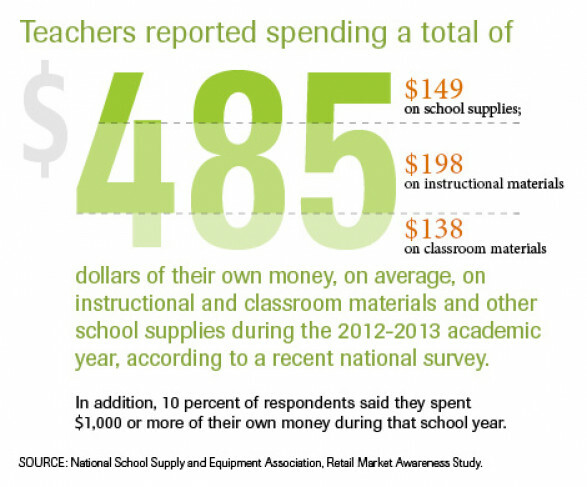 All told, teachers spent about $3.2 billion on various types of supplies and materials during the 2012-13 academic year, according to the survey, released recently by the National School Supply and Equipment Association. Half that total amount, $1.6 billion, came out of educators’ own pockets. 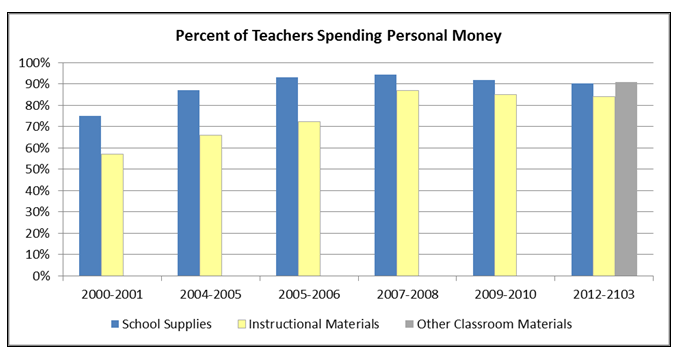 The per-teacher breakdown is as follows: The average educator forked out about $198 of their own money on instructional materials, $149 on school supplies, and $139 on other classroom materials, for a total of $485 last academic year, according to the survey. The majority of educators, 55 percent, did their shopping at discount stores, an increase from 30 percent from one of the association’s previous surveys, in 2006. Just 9 percent said they spent their own money at “parent-teacher” stores, the survey says. Some teachers also headed online to make those purchases: Sixteen percent reported buying over the Internet when they needed to buy their own educational products, a number that has risen over time, the authors said. Teachers are also downloading items for free from the Web. Eighty percent reported obtaining math and spelling worksheets that way; more than 40 percent did so for mazes and learning games, and smaller percentages did so for holiday decorations, maps, and other items. The survey was based on responses collected from about 400 elementary, middle, and high school teachers. The association released a summary of the survey findings to Education Week. The full report is available at a cost from the association, a trade organization based in Silver Spring, Md., representing suppliers and distributors of educational products, among others. In some cases, parents were asked to chip in for their children’s classroom materials. Twenty-five percent of teachers reported that parents were asked to do this, presumably by the school, a decrease from 47 percent in a 2010 survey. Something is rotten in Denma — er, the US when teachers, already being laid off and underpaid, have to subsidize schools from their own pockets while politicians are diverting public funds to private schools, pushing selective and inferior charter schools, and working to bust teacher unions. Is this a great country, or what? Ed, great question. Unfortunately, as we know, the answer is not yes anymore, if it ever was. Education has always been the proverbial football of politics, but with Duncan at the helm, the Obama administration has made public education a target, all in order to benefit what the dept of Ed. calls "alternative approaches." I’m doubly disgusted, because I voted for Obama twice. The first time, hoping for change, the second time hoping for fairness. Horribly disppointed both times!! This is nothing new. We have been doing this for years, even when, years ago, they gave us a small stipend to get some things. THat went away years ago and it is now on us. It is EXPECTED–even if it is not listed in our duties, we will be questioned if we don’t do it. Additionally, with this in mind, what are the rules about districts or administrators with regard to taking our things that we purchase? I would like to petition to make this a rule or law that includes policies and procedures. This year, I was shocked when I was going to move to a new area mid year, I had packed up my classroom, and had spent time carefully separating my things from the classroom/school purchased materials. During the planning for the move, I was out of the classroom already and coming in after hours to organize things. Then during this, I also went ahead and submitted my resignation for the following year, that would have been some months away. I don’t know if this angered my administration, but when I went back to collect the things that were still in the classroom (just days apart) , that I had told them were there, and that they were well aware of, they told me they had already moved them. They told me everything was in a records room. When I went in, about half of my valuable materials were missing and it was obvious to me. They said they had moved everything that was mine. I began contacting the principal again–vp and principal, and because it was so concerning, I copied HR. I was able to get back into my old classroom, and I found much of the materials that had been missing. NO one said a thing. they just stonewalled me. No one would take responsibility. I reported it as a grievance, and while all this was going on, they marked me down on my evaluation. They bargained with me to void the evaluation, if I would settle the grievance and agree that there was no wrong doing –I don’t know what to do, and I think that no teacher should have this happen to them. I want to change policy or put laws in place. Not only for theft, but for what I consider the ability to blackmail a teacher to keep them from reporting something such as theft. Does anyone have suggestions on what has been done in the past on this? I think a teacher should always be allowed to collect their things, regardless if they move positions, quit at the end of the year or even quit mid year for whatever reason. I consider this type of action that happened to me THEFT. A policeman who informally spoke to me told me that regardless if this was my workplace, if something is taken from me without my permission, it is indeed theft. However, I am still afraid to report it outside the district, because the district could give me an evaluation that could hurt my career. NO need to tell me that this doesn’t follow the rules. Theft doesn’t follow the rules either. Lets just say this is why we have a problem. Kinda the reason why I didn’t want to work in such a place when I saw they type of things they did. anyway, suggestions? WHat can we do to make sure teachers are protected from havaing the things they purchase, confiscated by the district or administration–teachers. And what can we do to keep teachers from being blackmailed from reporting wrongdoing? Guilty as charged. I have cut back over years due to cost increases, and no salary increase. As supplies purchased by the district have dwindled and quality of those supplies cheapened, it has helped to have an amazing admin assistant who is a whiz at finding and ordering supplies. Her searches save me time and money. I hope to "log out" of this habit more this year and ask for equitable furnishings and supplies in classrooms. Teachers across the country need to boycott purchasing supplies, etc. Districts are delighted we do it. why is this surprising. I was 1st hired after the year had started and did not understand the system very much. Needless to say I used my credit card to buy supplies for my students as they had to remain engaged whether they supplied the things needed for class or not. That first year was maddening. I have not fully recovered from that not stopped spending. I continued to spend a little less than the 1st year when small quantities of supplies were needed. I later was told about submitting PO but the red tape caused me too much grief I just did what I had to do. This is now 17 years later, I no longer teach an elective so I am spending a little less because the students by November do not have the basic paper or pencil to work with. Yes there is technology but who buys the ink and paper, and last year the printer? When the office printer is broken and there is one workbook……office depot. When additional supporting material is needed and bulletin boards, borders, supplies for experiments etc. who buys? I love teaching so I get what I need to improve the environment and help the students. Last year while buying supplies a man who accompanied his wife ( a teacher), to help her carry her packages, after surveying the piled carts of the teacher’s around (it was a teacher’s supply store) exclaimed to her "teachers have to buy all this stuff with their OWN money?" Her reply" of course, what do you think". Just imagine how much the rest of the society knows on the issue. They complain that teachers get too much holiday. Some teachers work at other jobs after school and during the holidays to supplement their income and sometimes to buy supplies they need the next year. I’ve said enough. Doba.com will give teachers access to their product catalog with over $2,000,000 products for free! This will give them access to wholesale pricing instead of paying retail at the store or on Amazon. They do the tough work finding the suppliers so educators can benefit by saving lot’s of money. They are willing to work with districts, schools and individual teachers. Their same online product warehouse is being sold to online retailers all over the world for lot’s of money. It’s awesome seeing a for profit company giving back to education! Doba.com will give teachers access to their product catalog with over 2,000,000 products for free! This will give them access to wholesale pricing instead of paying retail at the store or on Amazon. They do the tough work finding the suppliers so educators can benefit by saving lot’s of money. They are willing to work with districts, schools and individual teachers. Their same online product warehouse is being sold to online retailers all over the world for lot’s of money. It’s awesome seeing a for profit company giving back to education!